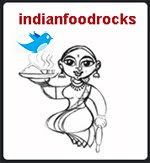 Indian Food Rocks: Happy Mother's Day! A very Happy Mother's Day to all the wonderful mothers who make this world special! This is Medha's gift to me this year. She made it in her pottery class. It is a pinch-pot made just like how the ancient ones, the Anasazi, made a wide range of pots and containers. The plant is a little wilted because she brought it home and hid it in the backyard in a very conspicuous bright blue plastic bag. I would have missed it if she hadn't led me to it by not allowing me in a particular corner of the yard that I had no intentions of going to! The next day we had high winds and it looked like it might storm, so I asked her to bring it in. It was a good thing she did because the poor plant was already suffering. We repotted it and we are hoping that it will survive. If not, we'll just plant some zinnias in it. I love my gift - it even has a hole in the bottom for the water to drain out from! It's going to be an extra-special Mother's Day for all of us. My gift to her is breakfast: I am making her favorite food, idlis! The batter has already risen and is threatening to overflow. I couldn't be happier! Manisha, A Very Happy Mother's Day to you. And May dear Medha's happiness overflow like the idli batter. The pot by the way looks super 'love'ly. That is the reason I wanted a daughter. Sons are so not daughters. THat present from Medha is pricelss, splendid! And guess what? We too had a beautiful idli batter today! But we made dosa because that is her favorite. Happy mother's day to you too, manisha. Please tell Medha she did a wonderful job with the pot. Manisha, Happy Mother's day to you! That pot is really beautiful, Medha rocks! Happy mother's day to you Manisha. Thats a beautiful gift from Medha. She is really very very talented. Happy Mother's day to you, Manisha.I hope that by now you have eaten those fluffy idlis. Good job, Medha. Happy Mother's Day Manisha! I hope the day is relaxing and fun- you deserve it! 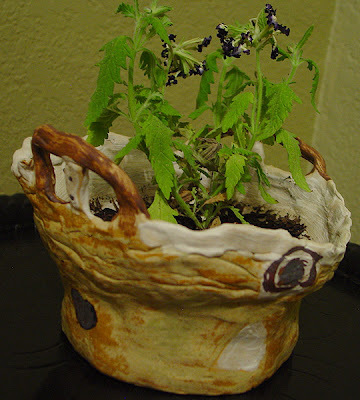 I am astounded that a child has produced this pottery. Tell Medha I believe she's brilliant. Nandita, she's not very happy with the pot but I really love it! At least this time she came home with stuff that we could recognize. ISG, a Happy Mother's Day to you, too! The idlis were very good and she ate 5 of them! Anita, my nephew used to make stuff for my sister all the time. Then there are daughters who couldn't care less. Mine goes all dewy-eyed for the day. I told her that there was only one gift I wanted. So she wanted to buy me an iPod or a Motorola Krazr. I want the krazr, of course, but there's no way she's buying me that! D is! The gift I want is "good behavior till the next Mother's Day." She just smiled and said, "I'll buy you an iPod." Musical, yes it is priceless! 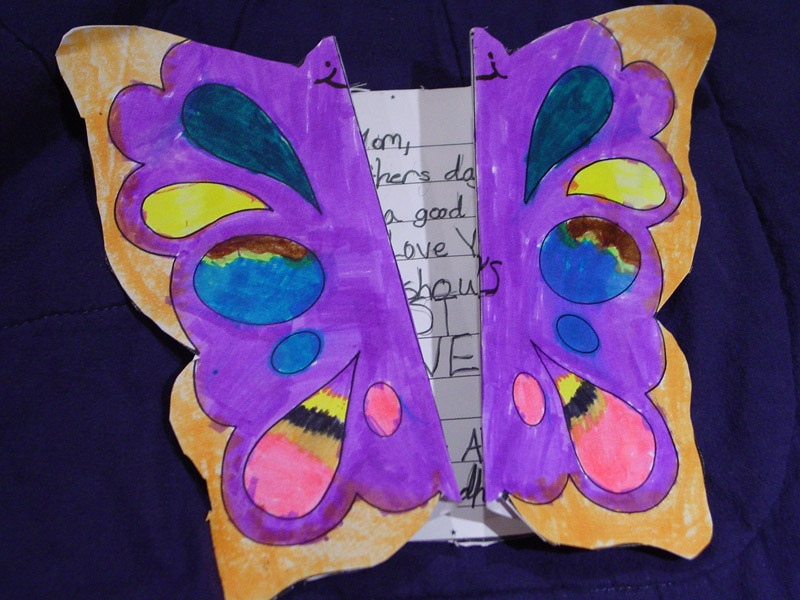 I still have the butterfly card from last year. RP, Happy Mother's Day to you, too! laze all you can today, I tell you! Do post a picture when you are up and about. I made a dosa for Medha, too. She asked me, "Do I have to eat a dosa after eating 5 idlis!" Gulp! She was hungry from waiting cos I messed up a bit. More than a bit! I had idlis steaming away, the onions and tomatoes stewing for the sambar when I realized I hadn't cooked the dal! I think it's all the Kerala coffee I have been having. It's better than alcohol! Thanks, Sig! Pottery isn't exactly her strong area but she enjoys it so much that I am loathe to pull her out. What she has in her head and what her hands produce are two different things. So even though she gets a lot of satisfaction from it, It is accompanied by a lot of frustration. But it's a great lesson in life and I am amazed by her tenacity. Gini, the idlis were fluffy. Delicious. Things were a little haphazard this morning but everyone is feeling very satiated. I have to go out and tackle a flower bed and I just want to crawl back into bed and sleep! Despite all that Kerala coffee! wow, that is one artistic daughter you have. the free form is so endearing. happy mother's day to you. So went South Indian the whole hog - idlies, dosas, and the not-decaf coffee as well. Hope they didn't bring on any headaches. Thanks! Bee, at least this time we didn't have to tear our hair out trying to figure out what she had made. Last session her instructor whimpered when I walked into the studio. She was afraid that Medha's creations would reflect on her ability as a teacher. She showed me something small and almost had tears in her eyes. Medha told me they were lips - as in human lips - parts of which had collapsed in the kiln. So yes, she is all about free-form. Sometimes, it is so free that we have no clue what it is! Anita, you mean I am not all that abnormal?! Phew! I felt so bad! No headaches! The other coffee that works is Panera's hazelnut coffee. Kerala coffee is very good! Medha is such an adorable daughter youre lucky Manisha. Tell her I'm her fan and loved all the things she's made till date. The sun catchers, bowls, pots. Shabash for her! Hope you had a wonderful Mother's Day Manisha. The pot looks cute. Please tell Medha that she did a great job! Hi Manisha, I came across your blog while bloghopping and indeed it is a wonderful one. I am very new to the blogging scene. You and your daughter are such artistic people. Thanks for sharing all your recipes. manisha, i am late but hope not too late to wish mother's day. i was off blogging radar for some time :) this gift is so touching. how old is she? mine is 3. Hey folks! A quick note to say I am travelling and will reply when I get back home next week. Until then, have a wonderful (Memorial Day) weekend! Oh! Was just coming to post "Where are you?!?!?" Happy travels and safe return.